We are one of the leading companies offering premium quality Navajo saddle pads. 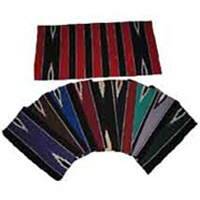 These Navajo saddle pads are available in different choices of colors and sizes. Our range can also be customized in terms of fabrics, sizes, colors etc. These saddle pads provide comfort for both rider as well as for horse. We are one of the well known manufacturers and exporters of horse clothing, saddles, saddle pads, navajo saddle pads, horse saddle pads, horse english saddles, horse blankets, horse clothing, horse bridles, horse pp leads, saddle cloths etc.